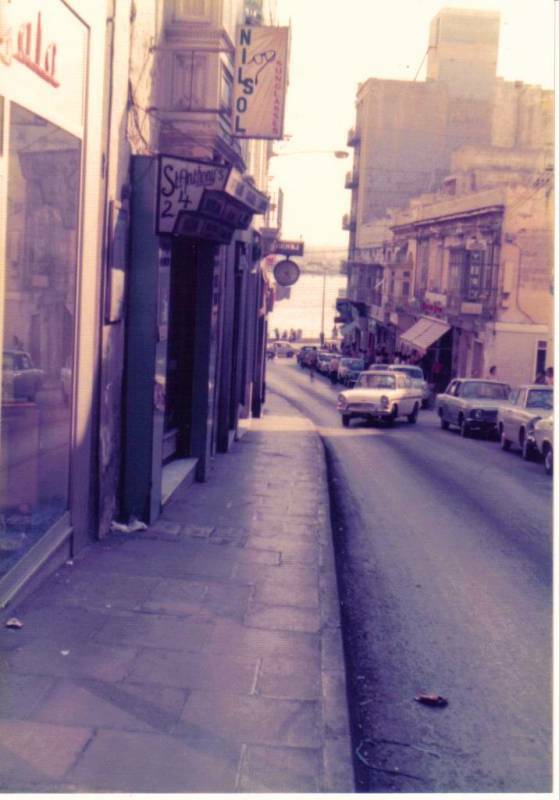 If memory serves me right this was the bottom end leading to Sliema creek, with the Blue Angel bar on the right. The road stretched right over the brow of the hill to Balluta Bay. Yes. Its now named Triq Manwel Dimech. And on a corner just down on the left was a small toy shop where I would buy my Matchbox toys and caps for the gun, joys of boyhood!! Yep! I can remember that now you mention it, and also having to climb the hill from Isouard Street to collect Christmas and birthday parcels from the Post Office situated on the brow. Did anyone illicitly buy any "Yacht" cigarettes (2 for 1d.) from one of the "holes in the wall"? 2 for a penny? Paradise! Of course not being as old as you lot I was too young to smoke!! You were never too young in my day. i must have had my first ciggy at nine/ten! First "Yacht" sold loose (2 for 1d, 5 for 2d. ), then "Flag" (10 for 6d), graduating to "Players "(10 for 8d). The state my arteries are in now though, I wish I hadn't.